This testimony is the outgrowth of the many queries that have resulted from the publication of volumes I and II of the Messages from Jesus and Celestials, which I first printed in 1940, and which have thereafter gone through three editions. On the publication of this fourth edition of volume I, I am integrating all those questions from interested readers into a new testimony, which will show how it was that Mr. Padgett was able to perform the work of receiving these remarkable messages. It tells how I met Mr. Padgett, my reasons for believing that he was actually able to receive messages, not merely from the Spirit World, but from the greatest spirits of the Celestial Heavens, whose Master is Jesus of Nazareth. I was born on November 10, 1876, at Aldershot, Hampshire, England, the tenth of thirteen children. I attended the public school there, and later completed courses at the Grammar School of Farnham, Surrey, founded by King Edward VI. Thereafter, I worked in the saddlery shop of my father, William Stone, at Aldershot, and later at London. When business slackened, I emigrated to Toronto, Canada, in 1903. On that occasion, my mother, who was a great believer in prayer, asked the Heavenly Father to let her know what His Will was. His answer was that I should go. In Toronto, one day, I was attracted to a notice of a Spiritualist meeting. Never having attended one before, I was curious and went. The medium, who was giving messages from the platform, pointed to me and said: "Your father, who says he is William Stone, is here, and is glad that he is able to greet you." The medium then described my father, such as I had known him. He had never been to the New World, and had died when I was seven years of age. Under the circumstances, this woman could hardly have been able to give this information without direct contact with the spirit of my father. After this experience, I began to read many books on Spiritualism, such as; "Nature's Divine Revelation", by Andrew Jackson Davis, also "The Great Harmonia" by the same author. These books had a profound effect upon me, for the faith in the religious doctrines which my mother, a strong Baptist, had taught me could no longer interest me as the repositories of the Truths. I believed in the existence of a Great Spirit World, and in the communication of mortals and spirits. At the same time, however, Spiritualism, as it was being taught, did not, I confess, completely satisfy my soul longings. Not until I met Mr. James E. Padgett and read the messages, which I am thoroughly convinced, came from Jesus and the Celestials Spirits, was I satisfied that at last I had really come to know the great religious (spiritual) Truths, and that I knew The Way to The Father and At-Onement with Him. It took me eleven years after coming to the New World before I met Mr. Padgett. Spirit guides advised my going to Detroit. There, the production of automobiles was such that it was impossible to maintain myself in saddlery work. Again, on spiritual advice, I moved to Buffalo. There, I worked and studied in a hospital for seven years and finally became a graduate nurse. This period of my life was, I feel, an important one in that it gave me that interest in healing, which later induced me to study chiropractic. In Buffalo, I continued to be interested in Spiritualism, and received another personal proof of Spirit Life. At one Spiritualist meeting, I was seated next to a woman, who happened to be a medium. She suddenly turned to me and said: "Your mother is here with you". I replied: "You must be mistaken, Madam. I had a letter from my mother quite recently, and she is in good health". The medium shrugged and replied: "Your mother never lived in this country. She tells me she lived in England and died a short time ago." She went on to report what my mother presumably had died of, described the funeral, and mentioned the names of those present. She told me that I had a sister Edith, from whom I would receive a letter confirming what she said. The letter arrived just as the woman had predicted and corroborated her statements. If I ever had doubts then, as to the Truth of spirit communication, I lost them at that point. As a matter of fact, I advanced in Spiritualism to the extent of going into trances, wherein I am convinced that I have been able to visit the Spirit World. I know I have met my mother there, a sister Kate, and a brother Willie who had passed on in 1908. I knew I was in my spirit body and had left my mortal frame. Indeed, I had no desire to return to it. But my mother and sister insisted that I had a spiritual work to accomplish in the earth plane, and that I could not come permanently into the Spirit World until I had accomplished that task. I could go on to relate many interesting and curious experiences, which I was privileged to have in the Spirit World. This is not the occasion for it, and I shall proceed with the narrative. During my work in the hospital, I had become interested in chiropractic. On the suggestions of spirits who communicated messages to me through mediums at Lily Dale, New York, I studied at the Palmer Gregory College of Chiropractic in Oklahoma City, and graduated in 1912 after a two year course. Shortly thereafter, I became a licensed practitioner in Washington, D.C. There comes to mind the name of a Mrs. Bartholomew, a trumpet medium, and a Mr. Pierre Keeler, a slate writing medium, whom I consulted while at Lily Dale. It was through this gentleman's brother that I was able to obtain a spirit photograph of my soulmate, Mary Kennedy. I shall refer to this in more detail later. Although I was kept busy at my boardwalk practice during the summer months, autumn found business so slack, due to the closing of many hotels and departure of people, that I was compelled to find another location. Again I went to Philadelphia and consulted Mrs. Bledsoe who, through her spirit contacts, advised me to go to Washington, D.C. I arrived there in November 1912, and opened an office on Fourteenth Street, N.W. There, I fortuitously met a gentleman with whom I had become acquainted at Lily Dale. His name was William Plummer, of Frederick, Maryland. He visited me at my office and told me he was interested in procuring a copy of "Was Abraham Lincoln a Spiritualist?" by Nettle Maynard Colburn. He wanted to find the owner of the copyright, for he wished to have the book reprinted. In his search, he had found the name of a Mr. Rollison Colburn of Takoma Park, but was informed that the latter was not related to the writer. The search, however, had not been entirely futile, for the Rollison Colburns proved to be interested in Spiritualism, and a common interest between them developed into a close friendship. I became acquainted with the Colburns through Mr. Plummer. I found them very kind and lovable people who were greatly interested in psychic experiences. It was through their son, Arthur Colburn, that I first heard of the messages that were being received by Mr. Padgett. I was introduced to him at his office in the Stewart Building, 6th and D Streets, N.W., where he was practicing law. This was in the early fall of 1914 when everyone was excited about the great conflict that had broken out in Europe. Some people felt the period ushering in the end of the world had come and that Jesus himself would appear at this "end time." For me, it was the end of my travels and spiritual search. These Messages from Jesus and Celestials, received through the hand of James E. Padgett, are so extraordinary in concept and contents (claiming as they do to bring to mankind the Highest Spiritual Teachings of Jesus as an epoch-making revelation from the spirit world), that it is indispensable, that as the publisher and firm believer in the Divine Truths contained in these messages, I give to interested readers and for future reference some firsthand information regarding the man through whom these messages were received, and how it was that he was enabled and selected to obtain these amazing communications. At this point, I must state that I was very often in Mr. Padgett's room when he was receiving these writings, and that I am the eyewitness to the formation and development of Mr. James Padgett as the medium "par excellence" through whom the Divine Truths of the Heavenly Father and Life in the Spirit World have come to mankind. My first contact with Mr. Padgett was in September 1914. I became interested in him at first because he seemed to be a fine gentleman, and what was also important to me, a genuine medium. We became friendly on the basis of Spiritualism and mediumship, and this became a bond which, in addition to our mutual respect and brotherly love for each other, which grew apace in the course of time, was never broken in this life until his death on March 17, 1923. This bond, I am convinced, continues to exist between us, his soul encased in a spirit body and mine still in mortal trappings. Mr. Padgett invited me to visit him regularly at his home at 514 E Street, N.W., Washington, D.C., where, in the course of time, I met Eugene Morgan and Dr. Goerger. Padgett told me that the messages he was receiving were from his wife, Helen, who had died early that year. She had written him many things about the Spirit Life she was living, describing her experiences at the time of her death, the sphere of her spiritual abode, and her love for her husband in the flesh, who, she had then discovered, was her soulmate. I was thereafter very often present as he continued to receive these messages. They came in a rapid sweep of connected words that obviously gave no time for thought on the part of the writer, and, in fact, he often insisted that he had no clear idea of what his pencil was writing until he read the messages afterwards. It was in this way, then, that he received from 1914 to 1923 some twenty five hundred messages, many of them coming, I have not the slightest doubt, from those highest spirits whose signatures were testimony to the personalities they represented. Interested as I had always been in Spiritualism, and in the possibility of man's communicating with departed spirits, I asked Mr. Padgett what were the circumstances leading to this mediumistic activity. The facts, as he related them to me, were as follows: About six months before I had met him, he had attended a seance held by a Mrs. Maltby in Washington, D.C. She informed him that he possessed the psychic power to obtain automatic writings from spirits, and challenged him to make the effort. He did so and found that his pencil moved automatically to produce what he called "fish hooks" and "hangers." When this had continued for a short time, he at length, obtained a writing which he could make out as a message signed by his wife, Helen. It was a short, personal note, which stated she was often present in spirit with him, and how glad she was to be able to write him in this way. At this point, Mr. Padgett did not believe the evidence of the writings that his dead wife had actually communicated with him. In fact, he wanted to know what proof could she offer, or was there, to show that a spirit was actually writing, and, if so, whether that spirit was actually Helen. The writing that followed provided incidents in their lives that could only have been known to both. Mr. Padgett thought even this could be explained as material coming from his own mind, as well it might, except that the writings came too quickly for his mind to formulate thought, and the messages kept on insisting that it was not his mind, but hers that was operating, with emphasis on her love for him and the happiness she could obtain by being with him. With his interest in Spiritualism greatly aroused by these strange writings, and anxious to set his mind at rest, he began to read books on the subject. I remember his reading J. M. Peeble's "Immortality", and his frequent attendance at seances. There, he was given to understand that spirits, if given the opportunity and under right conditions, can communicate with mortals, and that apparently, in his case, the writings he questioned came from his departed wife. He was advised to continue to take messages while learning more about the Spirit World. Among those things he learned was that souls have their mates, and that Spirit Life, contrary to what is taught by orthodox religions, was one of constant progress through the various Realms of the Spirit Universe. At the end of one of these writings, he asked what plane or sphere she was in. He received the answer that she was living in one of the planes of the Second Sphere, where a certain amount of Light and happiness is present, but that she had no desire to make progress to other spheres, because she could at that time make contact quite easily with him on the earth plane and write to him by controlling his brain and hand. Mr. Padgett told me he could feel her presence intensely, which produced in him a feeling of happiness that was alien to him, except when she wrote. Mr. Padgett confided to me that he would like to see Helen progress and told her so. He informed her that, through his own spiritual studies, he knew she could make her way to higher spheres and increased happiness as a spirit. Helen replied she would find out from his grandmother, Ann Rollins, who had been a long time in the Spirit World, what steps were necessary to make progress to higher and brighter spheres. I do not know why Helen turned to her husband's grandmother for guidance in the Spirit World. Many of Mr. Padgett's early messages were destroyed because they were of such a personal nature that he did not wish others to be acquainted with their contents. I do know that affinity of spirits in the other world is due to affinity of the soul, and not to any relationship one may have in the flesh. And, from what Mr. Padgett told me of his grandmother, and from the messages which she subsequently wrote (some of which I have inserted in these volumes), she must have been a very kind and warmhearted woman. At any rate, Helen later wrote about her meeting with Ann Rollins, who, she said, was a glorious spirit dwelling in the High Celestial Heavens. Ann Rollins, surprisingly enough for Padgett and those of us who were present at the time, had informed her that spirit progress to the Higher Celestial Realms could be obtained only by prayer to the Heavenly Father for His Divine Love through earnest longing of soul. In addition, Padgett's mother, Ann R. Padgett, also in the Spirit World, wrote through her son corroborating this information. Both spirits were thus instrumental in giving Padgett (and those like myself who used to be present at these writings) the knowledge that soul progress to the Celestial Heavens was achieved only through prayer to God for His Divine Love. These sessions, held to obtain writings from Helen, had become a channel through which a deep, religious note had been injected, replacing the personal material. From the scores of messages from Helen written at this time, and which are in my possession, we can follow her rapid progress to the Higher Spheres. Helen took the advice of these high spirits and prayed, and she found her prayers for the Father's Divine Love were answered, and that It came into her soul in a way that caused a purification of her desires and thoughts, with a corresponding change in her soul, and spiritual appearance. She said that her spirit body, reflecting the changing condition of her soul, was becoming etherealized and brighter. She then wrote that she had reached the Third Sphere where happiness was greatly increased. Shortly thereafter, she suggested that since she had done what Padgett had wished, and had been able to progress to a higher sphere, it was fitting that Padgett should seek to better his soul condition as well. In fact, she suggested that we should all do so. She stated that, since the soul is the same, whether in the flesh, or spirit body, it could be transformed by prayer to the Father for His Divine Love, not by ordinary intellectual prayers that came from the head, but from the heart and soul. Padgett refused to lend credence to this information. The spirits insisted that, as inhabitants of the higher realms, they possessed Knowledge of this Sacred Divine Truth, and that Jesus himself, ever interested in bringing the Divine Truths to mankind, would come to corroborate their affirmations if Padgett would give him the opportunity. I do not know exactly when the first message signed "Jesus of the Bible" was received, for as I write this, more than forty years later, I cannot remember the date. Padgett evidently felt it was absurd to believe that Jesus had written him, and alas, threw away the message. As a matter of fact, Mr. Colburn, who up to that time had formed a part of our fellowship, declared he could not be persuaded that Jesus had actually written. However, his friends, Dr. Goerger, Mr. Eugene Morgan, and I, had an instinctive feeling that Jesus had written a genuine message. The earliest message allegedly from Jesus to Padgett, which is in my possession, therefore, is dated September 28, 1914, and refers to an earlier message written a few days before. It is a long message, urging Padgett to pray for the Father's Divine Love, and stating that certain passages in the New Testament, thoroughly believed in by Padgett, were false. The Master went on to say that he was neither God, nor had he been conceived by the Holy Spirit in the way taught by the preachers of the churches. Further, that "...Neither is God Spirit only; a Spirit of Mind. He is a Spirit of everything that belongs to His Being. He is not only Mind, but Heart, Soul, and Love." The message urged Padgett: "... Go to your Father for His Help. Go in prayer, firmly believing, and you will soon feel His Divine Love in your heart." Padgett was doubtful. Though he was not entirely certain of the genuineness of the family spirits, he felt the need of asking whether Jesus had really written. In volume II, I have published some of the messages which he received from Helen, Ann Rollins, his mother, and his father, John Padgett, all corroborating that Jesus had written. You will also find in this volume II some of the early messages which he received from the Master. They tell Padgett to have faith that he is Jesus, and they encourage him to pray; but they are simply preparatory in nature and do not contain the wonderful contents and information which came when Padgett had achieved that condition of soul which enabled him to obtain them. At this point, it came forcibly to Mr. Padgett, and to me, that such messages could not possibly be the brainchild of his own heated imagination. He had been, as I discovered, an orthodox Methodist, and had for many years taught Sunday School in the Trinity Methodist Church (5th Street and Seward Place, N.E.) in Washington, D.C. His conception of religious doctrine was simply that which emanated from this Protestant church. This view of soul progress was contrary to what he had been taught. He had no idea of Divine Love, in contrast to the Natural Love, or what it might be, and realized that such a conception was foreign to his thinking and never could have been a product of his own mind. He therefore felt assured. I agreed with him, that these writings were actually not only from Helen, Ann Rollins, his mother, and departed spirits of mortals, but also from the Master, himself. He decided to follow those instructions, which he himself had never entertained, and which by that very fact had to come from outside intelligences which were communicating to him in this way. He, I should say, we, began to pray for the Divine Love, letting our soul longings go out to the Heavenly Father. In time, a feeling came glowing into the region of our hearts. We felt this emotion grow stronger and stronger with continued, fervid prayers. As we did so, our Faith in God became solidified and absolute. Never before had Padgett, nor I, felt so sure of the Real Existence of The Father and His Divine Love and Mercy. The cold, intellectual concept which we had entertained of Him had been transformed, through prayers for His Divine Love, into a warm, glowing, living, feeling of closeness, of At-Onement with the Heavenly Father, whose Love, Mercy and Goodness we could sense were personal and real. The change in Padgett's attitude towards the Heavenly Father, through the inflowing of His Divine Love, motivated a message from Ann Rollins. It recognized the effect which this Divine Love was having upon his soul, which was now a receptacle for some Essence of the Father's Divine Nature. It also reported on Helen's progress to higher spheres. Helen, she said in her message, was now a much happier spirit, and her spirit body shone with a radiance produced by the Father's Divine Love in her soul. Message followed message now from Helen, Ann Rollins, and, above all, from Jesus, encouraging Padgett to keep on praying and to obtain increased portions of the Father's Divine Love. As a medium, he might be used to transmit messages from the Highest Celestial Spirits. At length, Jesus himself wrote, that since Padgett had the ability to receive writings from spirits, should Padgett's brain be sufficiently transformed through Soul Development by obtaining more of the Divine Love, to a degree where he could receive high quality messages, he and his apostles would come and write through him the Divine Truths of the Father, of his mission on earth, and on the New Testament and Christianity! Only pray, and pray harder for the Father's Divine Love, urged the messages. "Go to the Lord in prayer and He will remove from your soul all that tends to defile it and make it alien from Him. He is the One that will cleanse it from sin and error. Only the teachings that I shall give you will tell the Verities of my Father. Let not your heart be troubled or cast down, for I am with you always. I will help you in every time of need. Only believe that I am Jesus of the Scriptures and that you will not be long out of the Kingdom. You are my chosen one on earth to proclaim my Glad Tidings of Life and Love. Be true to yourself and to your God, and He will bless you abundantly. Keep His Commandments and you will be very happy, and you will soon receive the contentment that He gives to His True Children. Go to Him in all your troubles and you will find rest and peace. You will soon be in condition to let the things of this world alone, as I need you for my service. With all my Love and blessings, and those of the Holy Spirit, I am, Jesus." Padgett was eventually convinced that he was being developed for a task of mediumship whereby great messages of religious Truths would be given to mankind through him. He prayed earnestly and frequently, and for the next three months, not only did Jesus write but also many of the apostles, especially John and James, who kept telling him to keep praying for the Father's Divine Love, but that the time had not yet come for the delivery of the great messages. Padgett's brain, while being changed in quality, had not yet reached that high quality which would permit the passage of communications of the kind they proposed. They continually urged him to seek for more of the Father's Divine Love through prayer to Him. Many times when I met him in his room, he would say to me: "Doctor, I feel the Divine Love in my soul in such intensity that I don't think I can stand it anymore." He would say this experience was always his when he had been praying for the Father's Divine Love prior to obtaining messages from Jesus and the Celestial Spirits. I can, in all sincerity state, if only for the purpose of corroborating his experiences, that these feelings were mine as well, if, perhaps to a smaller degree. While receiving these preparatory messages, it occurred to Padgett to ask how it was that Jesus had selected him to do this work, and what power, specifically, was there in the Divine Love which would enable him to succeed. Inevitably, there came the reply, in fact, one from John, the Apostle, and another from Jesus. John's message deals with the Laws of Rapport in the Spirit World which enable spirits and mortals to communicate, and the workings whereby the brain of the mortal is conditioned to receive various types of messages: intellectual, moral, and soul. It is a message of great importance to those who may be interested in developing mediumship, or furthering their mediumistic powers. But Jesus' reply is more direct. The message is printed in volume I, and so may be read in its entirety. But to summarize briefly here, Jesus wrote that two things are necessary for a genuine medium to receive the messages of the Father's Divine Truths, which were to be given shortly. First, the medium had to have thorough faith that the spirits of the Celestial Heavens, inhabitants of God's Kingdom in Immortality, were actual beings, who could, if the medium achieved a certain condition of soul, actually control their brain and write through them. If the medium did not have this Faith in their heart, then no contact could be made by the Celestial spirits with them. Secondly, the medium must be willing to submit to the conditions imposed by the spirits: They had to obey the instructions of the spirits and pray to the Father for His Divine Love; for it was this Divine Love alone that had the power to transform the brain of the medium so that it could be attuned to the thoughts of the spirits. This transformation of the brain could be achieved only through the development of their soul. By prayer, said Jesus, the Father's Divine Love inflowing into the soul transforms the soul from the image of God (with which human was created) into the Essence of God, so that sin and error in the human soul could not exist. The brain of the mortal, thus purified of material thoughts, and manifesting in his thoughts the condition of his transformed soul, could attain that condition which corresponded to the soul condition of the spirits. It was in that way that he could grasp their thoughts. That was the importance of the Divine Love. Padgett, in short, had to attain, through prayer to the Father, a soul condition approaching, to a degree, that of the Celestial Spirits in order for his brain to receive their messages. Prayer had to be constant, for, otherwise, renewed earth plane and material thoughts would naturally reimpose their dominance, and the Divine Love, and the high soul condition, would become inactive. Thus, said Jesus, Padgett had not been selected because of any particular goodness or freedom from sin, as compared to other mortals, for there were many who were in better, and in a higher spiritual condition than he was, but because of his Faith that Jesus could come, and his willingness to obey the spirits and pray for the Divine Love for a transformation of his soul so that the conditions for receiving these messages could be met. Furthermore, declared Jesus, he had tried for many centuries in the past to thus write his messages, and he had found many mediums who were far better gifted than was Padgett. But because they thought Jesus was God, or because they thought it was impossible for Jesus to write, or because of their religious beliefs and dogmas, they had refused to submit to the promptings of the spirits. And since man is endowed by his Creator with a free will, Jesus and the Celestial Spirits could not coerce them into submitting to a task to which they were opposed and in whose efficacy they had no conviction. For these reasons, Jesus stated, no other could be chosen except Padgett. First, permit me to state that I am a practical lawyer of 35 years experience and, as such, not inclined to accept allegations of fact as true without evidencing proof. I was born and reared in an orthodox Protestant church, and until quite recently, remained orthodox in my beliefs. That a little more than a year ago, upon the suggestion being made to me that I was a psychic, I commenced to receive messages by way of automatic writing from what was said to be the Spirit World. And, since that time, I have received nearly 1500 such messages upon many subjects, but mostly as to things of a spiritual and religious nature, not orthodox, as to the errancy of the Bible. I have not space to name, nor would you probably be interested in, the great number of the writers of these messages; but among the writers is Jesus of Nazareth, from whom I have received more than 100 messages. I will frankly say that I refused to believe for a long time that these messages came from Jesus because, God, while He had the power, as I believed, would not engage in doing such a thing. But the evidence of the Truth of the origin of these messages became so convincing, not only from the great number and positiveness of the witnesses, but also from the inherent and unusual merits of the contents of the messages, that I was forced to believe; and I now say to you that I believe in the Truth of these communications with as little doubt as I ever believed in the Truth of a fact established by the most positive evidence in court. I wish further to say that, to my own consciousness, I did no thinking in writing the messages. I did not know what was to be written nor what was written at the time except the word that the pencil was writing. The great object of these Messages from Jesus, as he wrote, is to make a revelation of the Truths of his Father. He asserts that the Bible does not contain his real teachings as he disclosed them while on earth; that many things that he said are not therein contained, and many things that are ascribed to him therein he did not say at all. And he wants the Truths made known to mankind. And I must say that many of these Truths, which he has already written, I have never heard of before, and I have studied the Bible to some extent. One thing in particular impressed me, and that is what the Truth is of his bringing "Life and Immortality to Light". The Bible does not state it. I have not been able to find an explanation of it in any commentaries on the Bible. But enough of this. I merely wrote this to assure you that I am serious in submitting the enclosed copy of a message for your perusal. I would not do this were it not for the fact that the message comments upon your article and also upon another article in the same issue of the Biblical World. I came tonight to tell you that you did the right thing by sending the message to the person who wrote the article upon the subject of Christianizing the Bible, for I now believe that he will appreciate it to a very great degree. He is not an orthodox churchman, but is the preacher of a Unitarian church in the little town in which he lives, and is a very broad-minded man. He may have some doubts as to the source of the message and may not feel inclined to accept, as true, your statements as to how you received it, but yet his doubts will not be altogether of such a nature that he may not have some hesitation in saying that such a thing as your receiving my message could not be true. At any rate, he will become interested in the subject matter of the message and will find some thoughts that he never before had. I fully realize that, when my messages are published, the great difficulty in their being accepted will be the doubt of the people as to their source. But you will have to complete the book in such a way that the testimony of the numerous witnesses will be so strong that the doubt will not be able to withstand the overwhelming evidence of my being the writer of the messages. And, when men read the same, they will realize that the Divine Truths which they contain could only come from a Higher Source than mortal mind, and that the Hand of The Father is in them. So, I will continue to write, and you to receive the messages; and when the time comes to publish them, I do not fear that they will not be, in time, gladly received. Very soon, I will write you another which will be of importance to mankind. I will only say further that I am with you trying to help you and to have you believe with all your heart in the Divine Love of the Father, in my mission, and in your work. By this time, of course, my original ideas about Spiritualism had undergone a radical transformation. In the light of the messages, Spiritualism could no longer simply be an effort to prove to one's satisfaction, through seances repeating the same process and ritual, that man did survive death, and that his spirit, though devoid of his fleshly frame, could appear from his spiritual habitat and give evidence of his post-mortal existence. 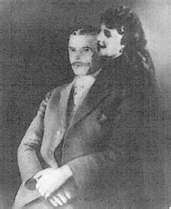 Both Padgett, and myself, now saw in Spiritualism, not merely belief in Life after death, and conviction in communication between mortal and spirit, but in a Great Universe of Spirits seeking progress towards Light and happiness through purification of their souls, and the possibility of transformation of these souls through prayer to the Heavenly Father for His Divine Love. Gone was my belief in vibrations, abstract intelligence, cosmic force, astral bodies and other paraphernalia of a bare and cold concept. Real Spiritualism took its well merited place as part and parcel of that sublime religion which affirmed that souls were alive, with, or without the flesh, and that these souls could be changed from the image of God, as Originally Created, into the very Essence and Divine Nature of God through His Divine Love. I did not have to look further. My search for God had ended. I had found God through the Messages from Jesus and Celestials spirits. On this subject, a message signed by St. Luke was received December 5, 1915, in which it was pointed out how limited and sterile Spiritualism was, unless Life was breathed into it through Faith in the Heavenly Father and prayer to Him for His Divine Love and Mercy. At the time of the first printing, I refrained from inserting St. Luke's message for fear of wounding the susceptibilities of Spiritualists, for it was to them that I first turned for the initial distribution of the messages. On this fourth reprinting, however, I have inserted the complete message, for its unmistakable stamp of authenticity will appeal to those many Spiritualists who have now combined its Truths with the Master's teachings of the New Birth. Before concluding, I want to write about my soulmate, Mary Kennedy, and about some new messages through James Padgett which I am inserting in volume I. These messages include three from Jesus, the one from St. Luke just mentioned, another from a member of the Sanhedrin which condemned Jesus at his trial, one from Helen and two from Mary. I am also adding photographs of Mary as she materialized in the studio of Mr. William Keeler, brother of Pierre Keeler, who, I have said, was a slate writing medium I had met at Lily Dale. The pictures were taken in Washington, D.C., in February 1920, where I sat; and in one she appeared poised and calm, with certain spirit lights about her head and partly across my body. Such illumination blotted out the black tie I was wearing at the time. Yes, my Mary is a glorious, living spirit of the Celestial Heavens. I have had many writings from her through Mr. Padgett, and more recently through an associate of mine. I hope you will enjoy the messages from her. The additional messages from Jesus include one received December 25, 1914, just prior to the writing of the great formal writings. Another, dated December 15, 1915, states that, because of the Divine Love which I had obtained, and my desire to help further the Father's Divine Truths, I had been selected by Jesus to do a work for the Kingdom. This eventually turned out to be the work of publishing the Padgett messages. I have since devoted my entire life to them and to furthering the Master's task of disseminating the Divine Truths to mankind. I feel that I have made a beginning in my lifetime, and that the work will be continued by my associates and friends everywhere. Dr. Leslie R. Stone, D.C., Spiritualist Trance Medium, publisher, Messages from Jesus and Celestials.